Stand and grasp a barbell with an underhand grip, generally slightly wider than shoulder-width. Keep your body in-line and stabilized by isometrically contracting your core (abdominal, spinal, and gluteal muscles). Note: Changing the width of your grip alters which aspect of the biceps are primarily targeted. See "Further Clarification" for elaboration. Curl the weight upward, exhaling throughout the movement. Repeat steps 3-4 for as many sets as are desired. 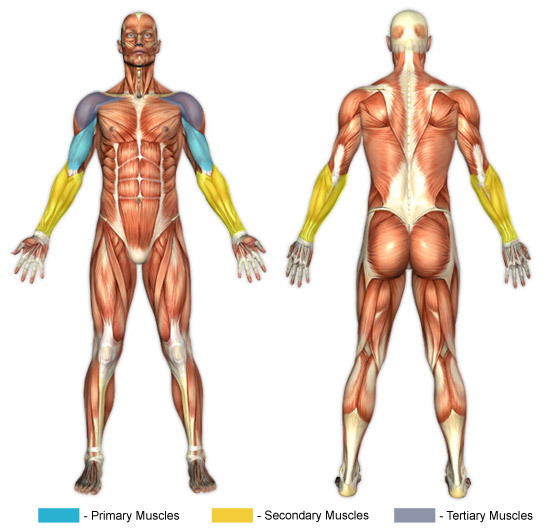 The primary muscular focus of barbell curls is the biceps brachii and brachialis, with supplementary work being done by the brachioradialis, flexors, and pronator teres of the forearms. The elbows can be raised forward at the terminal point of the positive aspect of the curl (i.e. contraction) to increase the intensity of the biceps contraction; when this is done the anterior deltoid also becomes involved. With the hands farther apart (i.e. wider grip) the short head of the biceps brachii (i.e. the inside of the upper arm) is targeted. With the hands closer together (i.e. narrower grip) the long heard of the biceps brachii (i.e. the outside of the upper arm) is targeted. Always control the weight, especially during the down movement. Letting the weight drop as the elbow reaches the bottom "locked" position causes tremendous stress on it that will eventually likely result in injury. Keep your wrists straight (neutral). It is in this manner that maximum biceps stress will be achieved. Bending your wrist in either direction (upward or downward) removes focus from the intended muscle, the biceps, and creates vulnerability to injury (elbow or wrist). Keep your elbows at your side throughout the movement, especially if you are a novice. Many people can raise their elbows (forward) at the top of the curl movement without becoming injured, though by raising the elbows the anterior deltoids become far more involved. If you are looking for a shoulder workout, then shoulder exercises better serve this purpose. However, there are experts who claim that raising the elbow(s) forward allows for a fuller contraction of the biceps. Use good judgment when determining whether or not to perform curls this way. Proper form does not always have to be maintained. Cheat Curls are an ideal solution to prevent joint injury on the last 2-3 reps of a set as muscle failure sets in.